Just like residential roofing, commercial roofs have their fair share of issues. Problems with the roof are, for the most part, avoidable with proper installation and regular maintenance, but identifying and addressing these issues remain important. A number of things can affect how well your roof holds or how long it lasts, such as the quality of the installation and products used, as well as maintenance and weather. 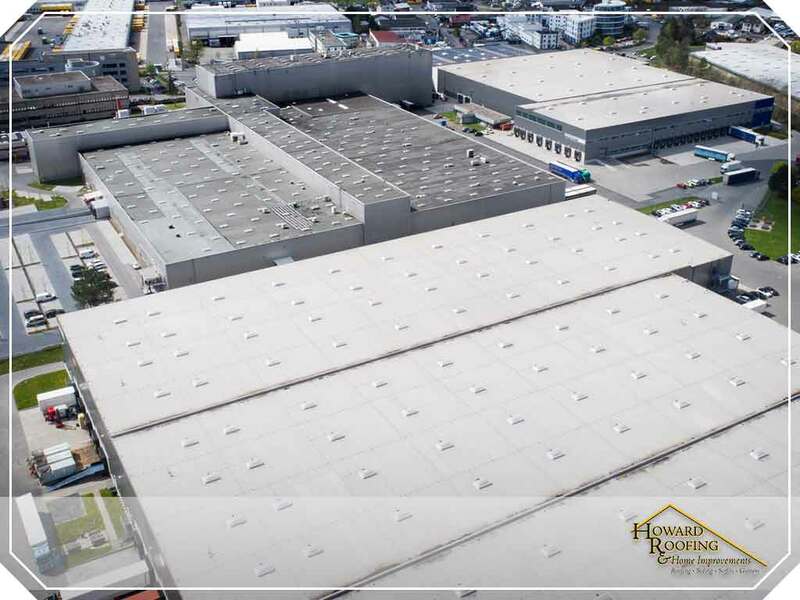 Over the years, our roofing specialists at Howard Roofing and Home Improvements have found the following problems particularly prevalent in commercial roofing. Luckily, most — if not all — of them are preventable. Your choice of roofing contractors plays a vital role in ensuring the longevity of your roofing system. Issues at the installation phase lead to future, potentially costly problems and can affect your roof’s performance and life span. Being hands-on during installation can help ensure all proper guidelines, standards, and procedures are followed. Insulated roofing requires moisture surveys before any overlays are placed. These surveys must be non-destructive. Howard Roofing and Home Improvement specialists can provide you with a detailed report about any information we gather during an initial inspection. Routine maintenance is perhaps one of the most overlooked aspects of keeping your roofing system in excellent condition. Problems caused by a lack of maintenance can lead to expensive repairs and safety issues. Howard Roofing and Home Improvements offers a regular maintenance program that can help you maximize your roof’s benefits as early as its first year. Leaks are common in many different roof types, particularly if the roof is not installed properly. Single-ply sheets are vulnerable to denting or blow-offs. Roof traffic causes punctures in the roofing material. All these physical problems can be spotted early on and dealt with before they grow into much bigger issues. Ask our experts about how you can minimize the effects of these common causes to help further protect your roof. Howard Roofing and Home Improvements can help you reap all the benefits of your commercial roofing. Call us at (636) 333-1690 or use our online contact form to schedule an appointment and get a free estimate. We serve St. Louis, MO, and the surrounding areas.